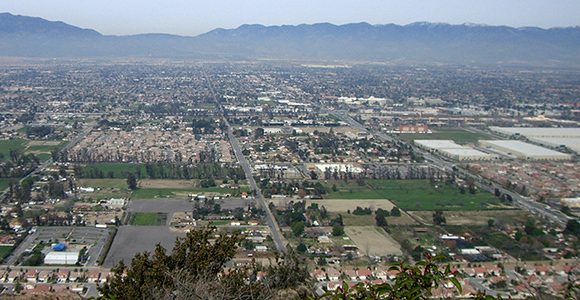 The City of Fontana in San Bernardino County (Photo Credit: JWut89LA/Wikimedia Commons). The lack of affordable housing in the Inland Empire is placing more families at risk of falling into poverty. That’s according to last month’s report by the California Housing Partnership Corporation. In both Riverside and San Bernardino counties, the report found that a majority of low-income families are spending more than 50 percent of their income on rent and overcrowding (more than one family living together) is twice the national average. The causes are many including rising rental rates and falling income among low-income and very low-income earners, as well as lack of funding for new, affordable units. In Riverside County, the official poverty rate is 17.6 percent, but adjusted for housing costs, it’s at 21.2 percent, which means more than one in five families live in poverty. To alleviate this problem, the report suggests that the two counties combined need more than 130,000 affordable rental homes. "It is just as much infrastructure as a road or a bridge or a hospital or a school," said Tony Mize, president of Workforce Homebuilders LLC, a Riverside company dedicated to developing and managing affordable housing in the Inland Empire. “You cannot not have housing for your lower-income workforce." Steve PonTell, president and CEO of National Community Renaissance, an affordable housing nonprofit developer agreed: “People that are not adequately housed demand more services than the people that are adequately housed. And if we had another 600,000 housing units in Southern California, those 600,000 would be paying additional taxes into the system. So the real problem we have is that NOT housing (the population) costs more than housing the population." Another issue for the Inland Empire is that it has also struggled for state funding for projects such as affordable housing construction. Mize said that historical perceptions of the area may be one of the reasons. Once known as the bedroom communities for Los Angeles and Orange Counties, the Inland Empire has come into its own. Other roadblocks to creating affordable housing in a timely manner include loss of redevelopment funding--the Inland Empire has lost about $274 million in affordable housing funding since 2008, according to the CHPC report--as well as the housing entitlement process. "The whole entitlement process of an affordable housing project in whatever city and whatever county has been done over and over." But, Mize added, "When it’s new construction and property has to be re-entitled for its use, the process can take two or three years. And yet the projects we’re producing are all kind of similar, so you should not essentially be starting from square one every single time." Mize would like to see more funding for affordable housing through the passage of bills such as AB 1335, The Building Homes and Jobs Act, which would generate funds through a fee on all recorded real estate documents. He is also hopeful that cap-and-trade funding through the Affordable Housing and Sustainable Communities (AHSC) Program will replace some of the lost redevelopment funds. PonTell sees affordable housing as part of a bigger picture where local governments tend to prioritize retail over housing and he would like to see that changed. "The local governments play the cards they’re dealt and they perceive retail as beneficial and they perceive housing as a negative from a local, fiscal perspective," said PonTell, adding "the shortage of housing is a primary contributor to the shortage of affordable housing." But there are some Inland Empire cities that are trying to ease the housing crunch. "The City of Riverside is trying to inject higher density in the downtown," said PonTell. "They think that having people downtown makes it a more vibrant downtown. So those are examples of how cities are starting to think more creatively." He added that the cities of Ontario and Rancho Cucamonga are also making an effort. Creating more affordable housing will be one of the key issues at the upcoming California Economic Summit, which will be held in Ontario November 12-13. Summit leaders, industry experts and elected officials will be challenged to figure out ways to build 1,000,000 more affordable housing units in the state over the next decade. "Providing affordable housing is a key to the economic growth of the Inland Empire," said Paul Granillo, CEO of the Inland Empire Economic Partnership and Summit Steering Committee Co-Chair. "We are one of the fastest growing regions in state, which means job and housing creation is a priority. We’re looking forward to discussing these issues at the Summit with leaders from around the state." Mize summed up the importance of affordable housing, citing "the lack of recognition by much of the public, many of our policy makers and elected officials that don’t understand that, if we had more housing, we would have more jobs."